In Jennifer Cook-DeRosa’s book, Homeschooling for College Credit, she shares her experiences in homeschooling and how to find/use resources, such as Saylor Academy’s free online courses. Jennifer Cook-DeRosa also created the Facebook group, Homeschooling for College Credit, where she has a grown a community of parents, but before that she started as a chef. She graduated from the Culinary Institute of America in New York then worked as a chef in Iowa. Later she worked with the local community college to introduce a culinary arts apprenticeship program, and helped create the first degree program of its kind in the state. We reached out to her to learn more about the story of Homeschooling for College Credit. David Thompson, Social Media Coordinator at Saylor Academy: Can you tell me a little about yourself and what inspired you to create Homeschooling for College Credit? Jennifer Cook-DeRosa: I left my career as a college administrator to homeschool my own children, but despite my background, as soon as my oldest started middle school I began to panic. I realized that I hadn’t developed a homeschool exit strategy, and didn’t know who to ask for help. That led me to begin researching high school graduation requirements and college admissions protocols for homeschooled students, and it was an overwhelming jumble of inconsistencies and gaps. Homeschool families don’t have access to resources and guidance counselors, so as parents, we have an enormous learning curve. Through my research, I stumbled onto an online forum community of adults who were earning college credit and degrees primarily through the self-study and testing process using CLEP exams. I spent weeks obsessing over every post in the archives, reading everything I could find. I was instantly intrigued by independent study and credit by exam, and I’ve always had an “all-in” personality, so I needed to get inside and take some exams. I started taking exams, and within about 6 months I’d accumulated enough credit for an associate’s degree. At that point I felt confident enough to help others with the pros and cons. I consider my educational philosophy to align well with many others in the homeschool community, so I knew that there were parents like me who would find my work useful. Homeschooling for College Credit was born after I’d spent 6 years writing for and serving as a daily contributor to the forum that helped me get started… The first edition of Homeschooling for College Credit and my Facebook page were both launched in 2012. Since then, I’ve continued to read and write daily about homeschooling and how it integrates with college and college credit. DT: What do you see as your main mission/goals? JCD: My personal mission is to help parents feel smart… I’ve worked in higher education long enough to understand that a certain amount of intimidation goes unquestioned, however, I believe an educated consumer is always better for the college, for the family, and for the community. As such, parents need to focus on how to get their kids out of college, because getting in is easy. Getting out takes strategy – saving money takes strategy, and saving time takes strategy. Homeschool parents are smart, and resourceful, so my mission is to help them see that they absolutely have what it takes to get their kids out of college with a degree. ​My mission for Homeschooling for College Credit is to attract and develop a strong servant-leadership team so we can achieve a network advantage. Our best resource is our collective knowledge, which is improved and multiplied by each new member. We are the only non-profit, non-biased, non-denominational, peer-to-peer community organization dedicated to helping parents make the most out of their teen’s high school career in this way – and we are all volunteers. DT: How has ‘Homeschooling for College Credit’ grown and changed over time? JCD: Over the past 6 years, we’ve grown to… 40 homeschooling moderators who manage 50 Homeschooling for College Credit Facebook groups and facilitate peer-to-peer learning for 13,000 families. So when I sat down to start the 2nd edition [of Homeschooling for College Credit], I already had an “audience” that were homeschooling for college credit with us. It took me over 2 years to finish, and I’m exceptionally proud of it. Whether or not people buy it? I hope they do, but I also hope they ask their local library to carry it. This kind of information should be free and readily available to everyone. DT: Where do you see Homeschooling for College Credit in the future? JCD: That’s a hard question, because anyone who runs a social community will tell you it’s a tremendous amount of work, and you’re constantly being told to monetize so you can become self-sustaining. Currently we don’t do any of that, and I hope to hold out for several more years. If I could develop one new area, it would be a Homeschooling for College Credit video channel. I created a couple of videos for our channel in the past, but that’s not my gift. If we have the opportunity in the future, that would help so many people. DT: What are some stories you have of students/parents who have benefited from Homeschooling for College Credit? JCD: Hearing “thank you” is so incredibly touching, and I love when people take time to send me a message… In a survey I sent out last year, the overwhelming majority of our parents report that their teen earned at least 30 college credits before high school graduation. That’s higher than the average college-bound AP student who has fewer than 21 credits. When parents email me, I’ll sometimes ask if I can share their story with the membership, because it is very encouraging to others. One family specifically comes to mind, she wrote to me about how they saved $97,000 because of what they learned in our group. Since her story was so extraordinary, I’ve actually featured it on my website. We’ve now also been around long enough that some of our member’s teens have even completed their college degrees – so it’s a daily thrill for me, literally. It’s the reason I log in every day. DT: How did you come across Saylor Academy? JCD: Prior to October 2015, I had a strict policy against promoting or discussing ACE credit in our Facebook groups (Saylor Academy would be in that category). This is one of the nuances of how homeschooling for college credit advice is slightly different than that for adults. Our families are planning for 2-3-4+ years down the line, haven’t earned a high school diploma yet, and have no access to financial aid, so we take transferability and risk of credit loss very seriously. As such, ACE credit just wasn’t a solid option for parents in our group. However, on October 28, 2015 I first wrote about Saylor Academy and their inclusion into ACE’s Alternative Credit Project. The launch of the Alternative Credit Project gave parents a written guarantee that their teen’s credits from ACE and NCCRS providers would transfer into a college, and that was a game changer for Homeschooling for College Credit. From that time forward, I’ve followed Saylor’s growth and though the Alternative Credit Project has closed, Saylor Academy has formed partnership agreements with colleges that offer the same kind of guaranteed transfer, and using partner colleges is highly encouraged in our group. Since Saylor Academy is the lowest cost ACE credit, my book includes a high school plan for parents who want to find the lowest cost options for a combined high school and college curriculum. This is a form of “DIY dual enrollment”, and since dual enrollment takes the autonomy away from the homeschool, the Saylor Academy high school plan is an excellent alternative, and it’s free! DT: What advice would you give a parent and their children on how best to take advantage of Saylor Academy’s courses? Choose the courses based on your high school plan first, and once you’re satisfied that your teen will earn high school credit, then decide if you want to pursue the college credit option. For instance, if your high school plan for 11th grade includes economics, Saylor’s free Microeconomics and Macroeconomics courses can provide curriculum for both semesters. The decision to pursue college credit can be made later. Since Saylor has a direct credit option, motivated students should attempt the final exam for college credit. The cost is so low that it’s silly not to! 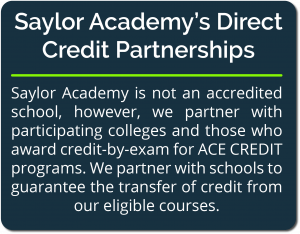 If your short list of target colleges don’t accept ACE or NCCRS credit (the type they’ll earn through Saylor Academy), you can still use the content for high school curriculum. Investigate if the target colleges accept a different brand of credit (AP, CLEP, DSST, etc.) you can begin a test-prep program after your Saylor course ends. I would like to thank Jennifer Cook-DeRosa for taking the time to share her story and the mission of Homeschooling for College Credit. You can follow Homeschooling for College Credit on Twitter (@HS4CC) and on Facebook. To learn more about Homeschooling for College Credit you can visit www.homeschoolingforcollegecredit.com. “Curling Hair” to Curbing Cyberattacks: Laticia Carrow’s Learning and Career JourneySaylor Academy is getting a new look!